Preheat oven to 450°F. Unroll thawed pie crust over top of an 8-inch round tart pan, pushing dough into bottom and up sides of pan, and trimming off excess around edge. Place in freezer for 15 minutes until dough becomes firm, then line tart shell with parchment paper. 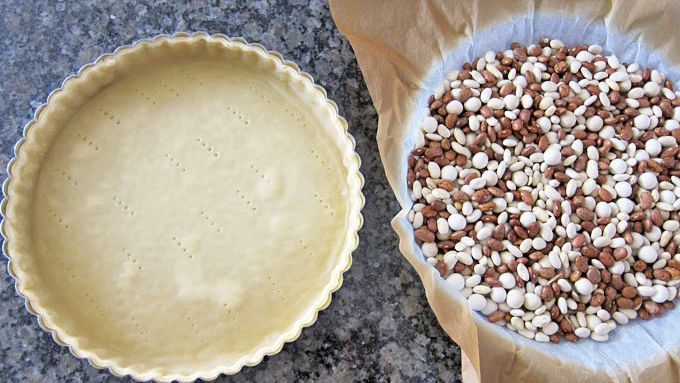 Fill parchment with dry beans or pie weights and bake for 8 minutes. Remove parchment and weights, and use a fork to prick several holes in the bottom of the shell before baking 4-6 more minutes until edges are golden brown. Remove from oven and allow to cool completely. 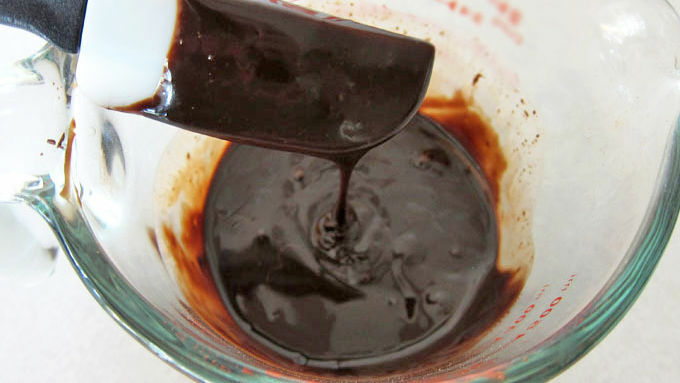 Pumpkin Ganache: In double boiler, combine all pumpkin ganache ingredients and stir occasionally until melted. Remove from heat and set aside to cool for 15 minutes. Chocolate Ganache: Pour chopped semisweet chocolate and heavy whipping cream into a microwave safe bowl and heat on high power for 20 seconds. Let the bowl sit in the microwave for 2 minutes, then stir until melted and smooth. If needed, heat for 10 more seconds and stir again. Let cool for a few minutes. 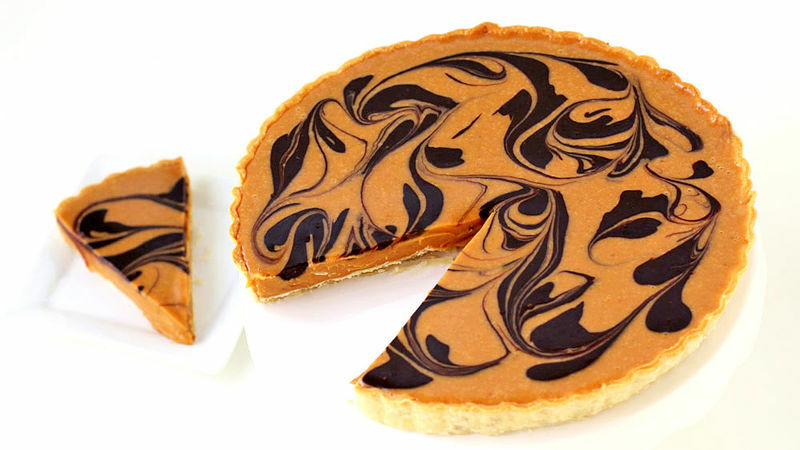 To assemble the tart, pour pumpkin ganache into the tart shell. 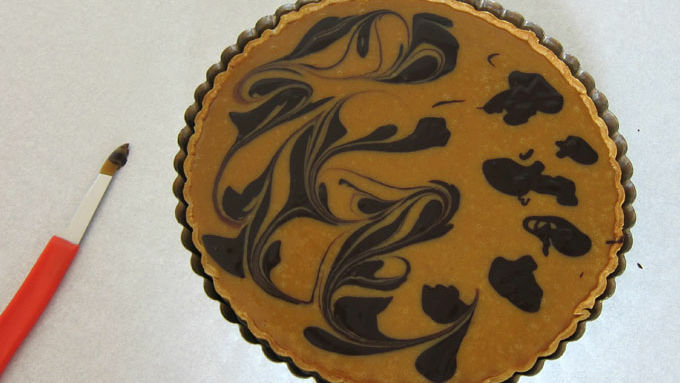 Spoon dollops of chocolate ganache around the top of the tart and use a knife to swirl the chocolate and pumpkin ganache. Refrigerate tart for at least 4 hours and chill until ready to serve. When you’re ready to serve the tart, use a hot knife to make clean slices. Run your knife under hot water and wipe it dry before making a cut. If you love rich and creamy, over the top, decadent desserts that are easy to make, you’ve got to try this Chocolate Pumpkin Ganache Tart. It tastes heavenly and looks pretty too. The best part is that it doesn’t require all day in the kitchen. This dessert has a warm and welcoming pumpkin flavor swirled with just a hint of deep dark chocolate. This amazing combo is perfect for fall. Be patient while the tart chills for at least 4 hours. (Believe me, it’s worth it.) Dig in and enjoy!